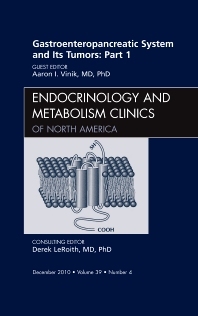 This two-part issue of Endocrinology and Metabolism Clinics of North America provides the endocrinologist with comprehensive essential updates about tumors of the gastroenteropancreatic system. Topics covered include the history and development of the gastroenteropancreatic endocrine axis; the changing face and epidemiology of neuroendocrine tumors (NETs); chromogranins current state of the art, pathology of gastroenteropancreatic (GEP) disorders; new and emerging syndromes related to gastrointestinal (GI) hormones; an update on incretins; prospects for ghrelin in the clinic, obesity/appetite and hedonism; GI motility disorders; gastric bypass and GI hormones; pancreatic exocrine function and GI hormones; harnessing the pancreatic stem cell; how to diagnose NETs before there are METs; NETs in kids: combining the SEER data for children and adults with site differences; novel biomarkers for NETs; standard imaging techniques for NETs; novel peptide imaging: glucagon receptor; signaling mechanism in NETs as targets for therapy; update on clinical trials; nutrition and the GEP; peptide radiotherapy; in vitro analysis of NETs: the role of angiogenesis; modern lab evaluation of peptide and amines: a continuing role for radioimmunoassay? ; surgery/surgical management of NETs; and evaluation and quality of life in NETs patients.